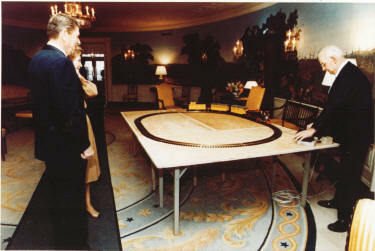 Duane and Lee determined late in 1982 that they should try to give President Reagan a set after seeing a piece on TV where the President stated he always wanted a toy train. After much political discussion on both sides of the isle, a time line was determined and a train set was sent to the White House. 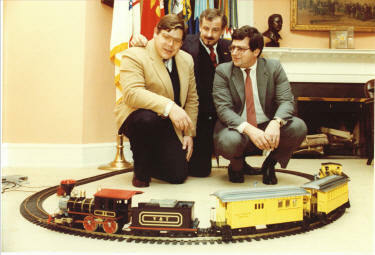 In January of 1983, Lee Miller took a set to Washington, D.C. consisting of an engine, tender, two passenger cars and a caboose. When he arrived at the White House he was met by an aide who told him there was good news and bad news. The good news was they were ready to accept Lee and the train. The bad news was, the President was just leaving via the presidential helicopter on the back lawn. Lee took it all in stride and assembled the set on the floor in what may have been the Roosevelt Room of the White House. After Lee had long departed, Mr. Reagan returned and was pleasingly surprised with his brand new Kalamazoo Toy Train produced in Bangor, Michigan. The sound system on the train was high tech for its time. A recorder of sorts was able to plug into the controls of the engine to produce an array of sounds. "Hail to the Chief" was recorded and played through the system as it rolled around the tracks. Several photos were taken by White House Photographer, Jack Kightlinger and later sent to the Millers. One of the photos was signed by the President and had a short message of thanks. The President was so pleased that he asked his personal secretary to get one of the Millers at the Bangor Train Factory on the phone. The call came before Lee made it back home. Duane took the call at the factory somewhat skeptical that it was really the president on the phone. He became reassured when he heard the Presidents voice. They spoke for 10 or 12 minutes about small towns and entrepreneurs among other things. 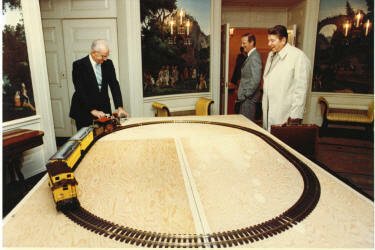 Mr. Reagan told Duane that he had received other toy trains, but this was the only one sent by a manufacturer. Federal law prohibits the president from accepting gifts from anyone. Technically this was a gift to the American People. 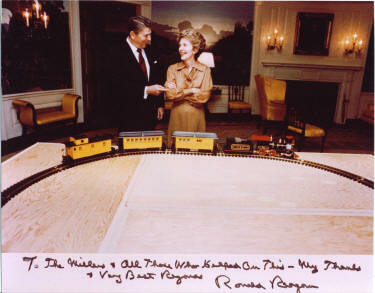 President Reagan's secretary noted that the President wanted the train to be in his personal library and museum in California. Today the toy train is in a display case in the National Railroad Museum in Strassburg, Pennsylvania. Duane miller is on a personal crusade to have it moved to the Reagan Museum in California as per Mr. Reagan's wishes.